Lunchtime, for a quick pint to wash down a pie & mash lunch at Manze’s nearby. Adnams - Cashmere IPA 4.70 Pale gold in colour and Adnam’s have gone the full citrus here. Somehow ended up in here with a couple of friends after a long day out in Peterborough. Dark Star - Darkness 3.50 A rich, black, Poter-ish beer with hops. Five Points - Hook Island Red 6.00 Bittersweet, fruity and strong. Early evening visit. The pub is rather quiet and has a nice, laid-back atmosphere. A large room at the rear has been brought into use since my last visit (and it has a Scalextric track for customer use) plus the garden has been beautified. Redemption - Trinity 3.00 Hard to resist this pale gold, low-strength, full-flavoured beer. East London (ELB) - Orchid Vanilla Mild 3.60 Just a half of this vanilla-flavoured mild. First time I have been in these parts in daylight for a while, and I see that the pub’s ground floor fascia has been stripped away to reveal some old Meux Brewery signage. Ramsgate Brewery (Gadds') - Dragon's Blood ESB 5.20 Slightly sweet, full-bodied, malty, ESB-style bitter. Wild Card - Jack of Clubs 4.50 My understanding is that Wild Card are still brewing their beers at Brentwood Brewery, whilst their permanent Walthamstow base is developed. This is a good, traditional bitter with bitter hop and a firm malt base. I missed the re-opening night party the night before, but made up for lost time tonight. Antic are working their usual magic here and the pub is almost certain to be a success given its prime location in the middle of Walthamstow Market. In typical Antic style, it has the look of a place where the builders did a bunk midway through the restoration. Clarence & Fredericks - Golden Ale 3.80 Golden in colour and temperament. Great, fruity, hop taste. East London (ELB) - Nightwatchman 4.50 A nice, dark, fruity and slightly roasty bitter. 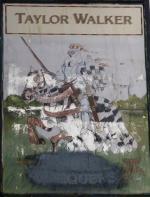 The pub is found in Walthamstow, Greater London, E17 7BX. A high street pub that was present here by 1699 and was at the heart of Walthamstow civic society for many years, acting as courtroom and meeting place. Destroyed by fire in 1791, it was quickly re-built and by the mid-nineteenth century it was tied to the Thorne Brewery of Nine Elms, passing later to Meux and eventually to Ind Coope. 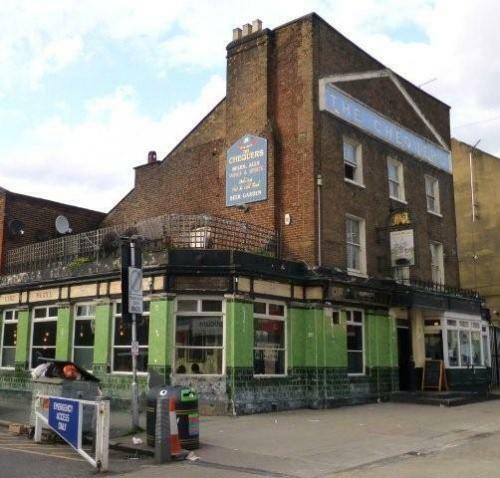 This was the place to which the Kray Gang, who had a close association with the pub in the 1960s, fled immediately after the shooting of George Cornell at the Blind Beggar in 1966. The pub is well known for having the stroke of the letter ‘Q’ on the wrong side, in the large, engraved lettering which adorns the front of the pub. Closed on police advice in July 2012, the pub re-opened on 7 March 2013 after acquisition by the Antic Pub Co. Antic did not hold the lease for long, and the pub is now run on a similar basis by an independent company. It is spacious, with a variety of seating possibilities. Outdoor seating to side and rear. We have visited this pub 5 times, seen 25 different beers and tried 9 of them.